Well, we don't have a fireplace, so you can forget about him coming in through the chimney and stuff like that there. I suppose he could enter through the front door or through one of two patio doors, but that would set off the alarm and freak everyone out. Opening a window would also have the alarm waking up the neighbourhood, not to mention scaring the hell out of the reindeer. I have a gas fireplace which has a small vent out the basement wall. No luck there. A bit of a tight squeeze! HAHAHA! That is funny, Jenn :) I can even picture it happening! We do have chimney. But some how he makes apperence at our place, I guess it magick at it best. He's magical. Maybe he'll just materialize! We always had a fireplace but I supose he could just come in the front door if you leave it unlocked. 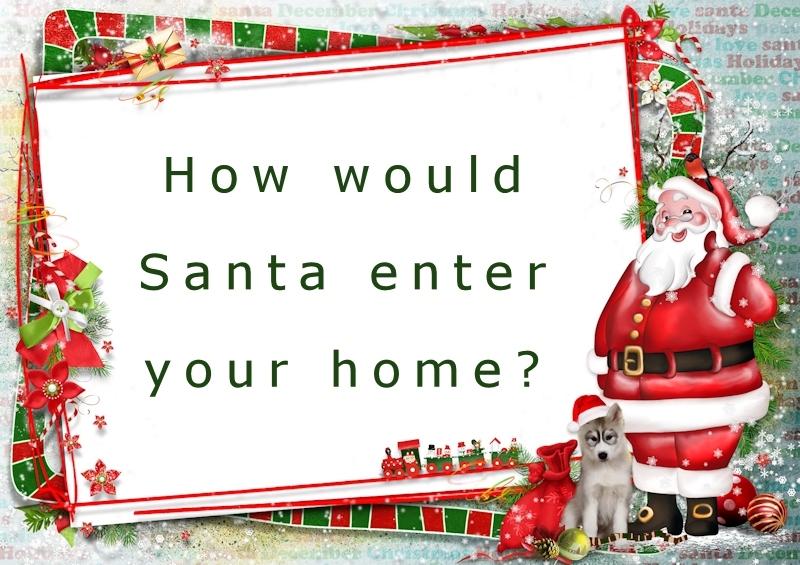 I have also see “santa keys” you can hand outside your door and only he can use it. Santa keys! How creative. I've never heard that before. That is very cool. I'm sure Santa has kept up with the times and can download himself into your house via your internet connection. But in many cases, he might be stopped by the ad blocker. I guess he'll soon need to get one of those Star Trek transporters. I do have a fireplace, too big for him and it's locked by a metal door. He'll have to find another way to get in! No fireplace here. I think that he had phaser transporters (Star Trek) long before humans thought of them. I think that when he puts his finger on the side of his nose (he's not wiping it) that it transports him into the house and then out again.